Isaac Seumalo could be trade bait this offseason. The "Philadelphia Eagles Football Team," as Donald Trump put it, are just that, and HEY(!) they actually did football stuff today in front of the media. We have notes. • In the first media-attended OTA practice on May 22, Carson Wentz participated in individual drills. In the second media-attended OTA practice on May 29, Wentz participated in individual drills and 2-on-2's (2 WRs/TEs/RBs vs. 2 DBs/LBs). In the third media-attended OTA practice here on June 6, Wentz participated in individual drills, 2-on-2's, and 7-on-7's, though by my count, he only took four snaps in 7-on-7's. What would you do without my charts? Anyway, while there's some level of progress, it'll probably be a while before Doug Pederson allows Wentz to be anywhere near a pass rusher, even with a red jersey on, as the Eagles don't need some eager-to-impress rookie defensive lineman accidentally falling into his knee. Additionally, after 7-on-7's, Wentz took his brace off and was doing sprints off to the side while the team ran 11-on-11's. • In the three practices the media has attended, Isaac Seumalo has not participated in any way during team drills other than to serve as the shotgun snapper during 7-on-7's, 2-on-2's, and 3-on-3's. In other words, he has done no blocking at all. This is the role that is typically reserved for the fourth string center, if there is one. At times in the past, this job went to Jon Dorenbos. Seumalo does not appear to be injured in any way, so his near non-existent role during OTAs is interesting. Clearly, Seumalo would be the second string center if the season began today. So why isn't Seumalo participating in team drills? I'd ask him, but he's never around during locker room sessions. One theory could be that the team is keeping him from getting injured and potentially shopping him. As we noted a couple weeks ago, Seumalo is a player who would make sense for the Eagles to trade. 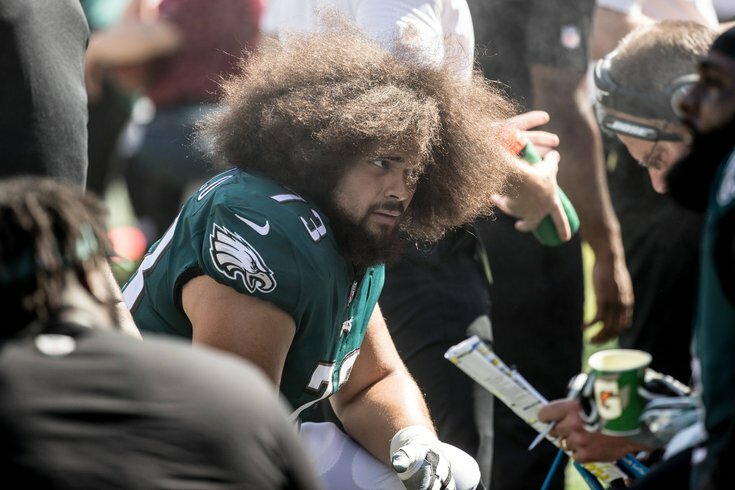 A year ago, after an encouraging rookie season, Seumalo was being thought of as a long-term replacement for Jason Kelce at center. Now? Not so much. Kelce was arguably the best center in the league last year and is now a Philadelphia legend, while Seumalo was a rare disappointment on a Super Bowl winning team full of overachievers. That situation deserves a continued look as the spring continues. • One of the early standouts in spring camp so far has been De'Vante Bausby, who played in four games for the Bears in 2016, and spent the 2017 season on the Eagles' practice squad. That strong start continued today, as Bausby picked off two passes and broke up a third. If the Eagles like what they see from Sidney Jones, Avonte Maddox, and Bausby, they might feel more comfortable dealing Ronald Darby, who was thought to be on the trading block prior to the 2018 NFL Draft. • Speaking of Avonte Maddox, he has played well during media-attended practices. Maddox had great coverage on one rep today from the slot in which he read an in-route early, was able to jump it, and come up with a pass breakup. He showed confidence and aggressiveness on the play. To note, it's very early. As Aaron Rodgers noted this week, "pads are a great equalizer, so you don't want to make too early of a judgment" during non-padded OTA practices. A better evaluation of Maddox will occur during training camp. • In other rookie news, DE Josh Sweat was defeating OT Jordan Mailata with ease. Mailata had no chance against the speedy and explosive Sweat. • Jake Elliott was 1-1 on field goals. I have no idea how far out it was, as the majority of practice was conducted far away from where the media is allowed to stand, hence the lack of voluminous notes today.